If you have changed your mind about a purchase, you may return the items in new and unused condition within 28 days of receiving the goods, to our Berkhamsted address. The goods must be in their original condition, including all packaging, e.g. shoes to be returned inside the original shoe box. Used items will not be accepted under any circumstances. If products being returned came with free items as part of a promotion (e.g. free tennis balls), these items must also be returned. If they are not returned, we reserve the right to make a suitable deduction from your refund amount. Items which have been subject to customisation (e.g. custom restring or re-grip) cannot be returned unless there is a manufacturing fault with the original item. Consumable items such as strings cannot be returned as faulty as they can break quickly depending on usage. Sports bras, sports drinks bottles and headwear cannot be returned for hygienic reasons. It is your responsibility to ensure that the items are sent back using a safe and secure method. 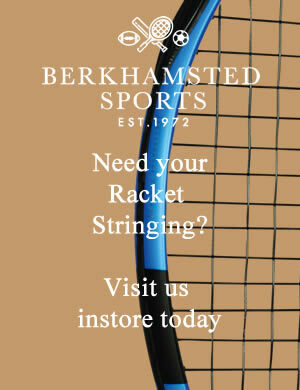 Berkhamsted Sports Ltd advise that you send your returned items back to us via some form of recorded delivery so that we have to sign for it. This means that if your parcel is lost in the post you will then be able to claim from the carrier for the goods that were lost. If you return your parcel via a form of delivery that is not guaranteed then Berkhamsted Sports will not accept responsibility if the parcel is lost or damaged. If you are returning an item using a printed returns label supplied by us, you must ensure that you take proof of posting from the Post Office. In the event that the parcel goes missing and no proof of postage was taken the customer is liable for the cost. If you are sending back items to be exchanged, please state clearly the product code, name and size of the new item(s) you require. Refunds (excluding postage) will be processed within 30 days of cancellation. We will only refund the postage back to you IF WE have made a mistake, e.g. sent out the incorrect size. It is important that you inform us of any damaged/faulty goods immediately and we can arrange to have the faulty item returned back to us to avoid any further postal charges. We will then inspect the item and if required, return it to the manufacturer for inspection. If the item is deemed faulty under warranty we will replace your item. If you return an item to us outside of the terms of our returns policy and your statutory rights do not apply, we may not refund you. The item may be returned to you at your expense and you will be notified of this and any other charges. If you choose to send the item back to us again, or refuse to accept delivery, this will be deemed as an irreversible instruction for us to dispose of your goods without further notice. This will not constitute any admission that we have failed to honour in full our obligations to you in full and will not constitute any unlawful action against the goods. All orders require a signature of receipt to ensure your parcels do not go missing in transit. If however you have not received your parcel yet the tracking is showing as signed for, please complete and send us this form for us to investigate. These forms will be processed with urgency. Until we complete the investigation we will not be able to send out a replacement or issue a refund.